Why I read it: It’s by Margaret Atwood! Here are brilliantly rendered stories that explore themes of loss and discovery, of the gap between youthful dreams and mature reality, of how we connect with others and with the sometimes hidden part of ourselves. In each of these tales Margaret Atwood deftly illuminates the single instant that shapes a whole life: in a few brief pages we watch as characters progress through the passions of youth into the precarious complexities of middle age. By superimposing the past on the present Atwood paints interior landscapes shaped by time, regret and life's lost chances, endowing even the banal with a sense of mystery. Richly layered and disturbing, poignant at times and scathingly witty at others, the stories in Wilderness Tips take us into the strange and secret places of the heart and inform the familiar world in which we live with truths that cut to the bone. If you saw my post from last month, you know that I absolutely adore Margaret Atwood. But unfortunately, many of her novels are very long, and therefore do not lend themselves well to reading in the midst of all of my schoolwork. So, when I saw Wilderness Tips, a book of bizarre short stories, I knew I had to get it. These stories are Atwood through-and-through. Each story, even if it starts out seeming “normal,” has a bizarre twist or quirk that pulls you in. The stories all (for the most part) do have similar themes, which made them somewhat predictable after a while, but their progressions were still unique. Many of the stories deal with extramarital relationships or forbidden relationships, and, I have to admit, I did get a little tired of reading about people pining after others with whom they could never have a “real” relationship. I think I would recommend not reading the full book at once, but reading a couple stories at a time, then putting the book down for a while (and it is thus pretty good for really busy people). Also, the stories are all a bit depressing, which does not bother me, but if you are looking for something upbeat, you probably want to look elsewhere. Many of these stories have to do with the body and people dealing with bodily issues or the way in which others perceive them, which I found kind of coincidental and interesting because for the last two semesters, I have taken literature courses focused on the body—this book could easily have been a reading for my class. I consequently probably spent a bit too much time focused on these bodily aspects, but I think that made the stories all the more interesting. Unfortunately, I read this about a month ago and can’t remember which stories I enjoyed in particular—some were better than others, but I feel like different stories appeal to different people. While I cannot say that any of these stories “blew me away,” the majority of them were interesting and quirky, providing twists on the common theme of forbidden love. I agree that the stories were uneven. I highly recommend the novel Cat's Eye--and it is a very fast read even though it is long. Lifetime Reader-- I LOVED Cat's Eye!! I'm a huge fan of Atwood's work; however, I'm not familiar with this title, so I'm glad you reviewed it. Thanks! Agreeing with everyone else that Cat's Eye is amazing. And relatively short too. 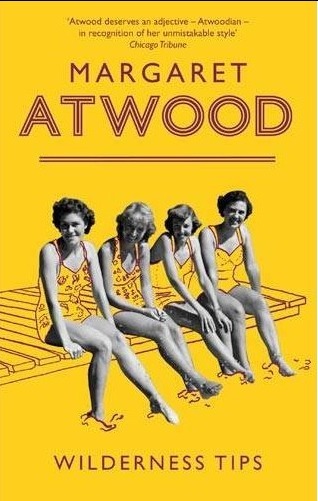 I'm not sure if this book would be for me as I love Margaret Atwood but have an aversion to short stories. I'll definitely have to get my hands on Cat's Eye! Sam -- I never was a big fan of short stories either, but I started reading them this year because I've been so busy, so I can just read one and not have to worry about putting it down and totally forgetting what happened in the first half of the book. I still like full length novels better, but short stories are good too.